I would have never guessed..
Burger King, we have burgers! ...if you can call it pizza. It's pretty awful is what we're saying. Oh Darn I was looking for a Hut. 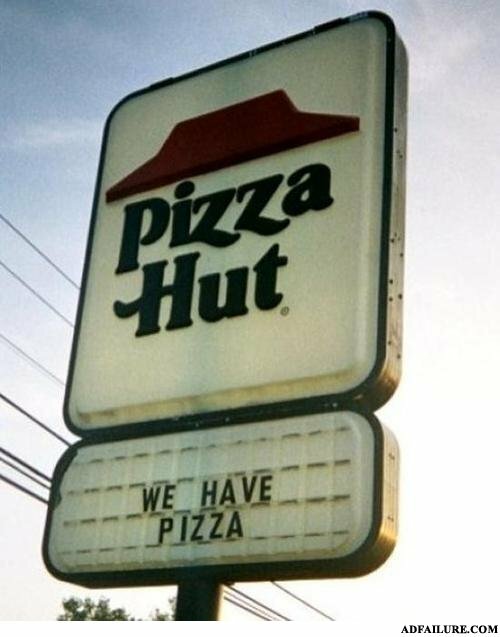 Protip of the Day: Pizza Hut has Pizza. Finally a place in town that has pizza!! So that would mean that burger king sells burgers? Goddamn it, who didn't give me this information sooner! I was just informed about this, so ALL YOUR PIZZA ARE BELONG TO US!!!! You can't always assume everything based on it's title. Take walmart for example I see not one wal for sale. A blonde, a brunette and a redhead were going for a walk. They spotted some tracks, and stopped to inspect them.